I love a good chicken recipe. You just can’t go wrong with ’em can you? I’ve made this grilled honey teriyaki BBQ chicken 4 times in the last month. Once as baked wings for my niece’s graduation party, another time for dinner, another time to record me making it so that I could share with you guys and again because I forgot to take a final photo of the finished product! My family hasn’t minded the repeats at all. 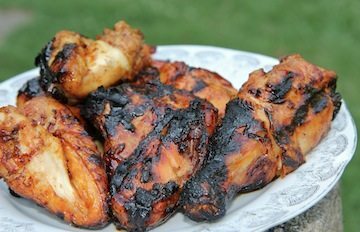 This honey teriyaki bbq chicken taste great baked or grilled. The sauce is sooooo yummy! I couldn’t stop dipping into it. I’m anxious to try the sauce on some appetizer meatballs and kabobs. I bet that would be amazing! Watch me make this grilled honey teriyaki bbq chicken from start to finish! Lightly coat chicken in olive oil. Season chicken generously with season blend. Prepare the honey teriyaki sauce by adding all sauce ingredients in a small pot. Bring to a boil over medium heat while stirring. Place chicken on generously greased grill. Flip the chicken once and brush sauce on the other side of chicken, repeating multiple times as the sauce cooks onto the chicken. When chicken is done remove from grill. Let chicken rest for 5 minutes. ~TIPS~ Take advantage of indirect grilling and move the chicken around if it starts to burn. Cooking times may vary. I cooked each side for 20-25 minutes. The sauce taste better the next day but still awesome the first day! Ya know what, even if you don't put that BBQ mixture on the chicken, it's still FAB!!! My toddler loves it just seasoned with the spices and grilled. I am so pleased with your site! U make me look llike I actually grew up cooking. In actuality, I dont have that skill yet, but your recipes have people thinking Im the go-to woman for great food! Lol. Thank u so much! I love being able to go healthy or soul and you even have the teas!!! Yessssss! Thanks! GREAT video! I am so excited to make this tomorrow afternoon! Your enthusiasm is a breath of fresh air on the internet! Keep up the great work! I was worried because I didn’t quite have enough honey. (I was at the grocery store like “of course I have plenty of honey at home!”) Maybe just under an 1/8th cup short. The honey came through in the flavoring just fine and the sauce was great!! I also used Stubb’s Hickory Mesquite bbq sauce and 365 Teriyaki Sauce (which, by the way, is pretty awesome right out the bottle) I BBQ’d on our charcoal grill and just kept basting and basting. You’re right, even the charred parts tasted yummy! Thanks for another great recipe! I loveeee this recipe so much! Keep it up Monique ! Just a question, what brand of seasoned salt do you prefer ? Omg!!!! Perfection! Thank you so much Monica you’re awesome!!! Keep them coming! I just made this chicken and followed your recipe to the letter and wow is all I can say. I bought both recipe books and can’t wait for the next one! More than 5 stars! This is a very good bird! The sauce is bananas!